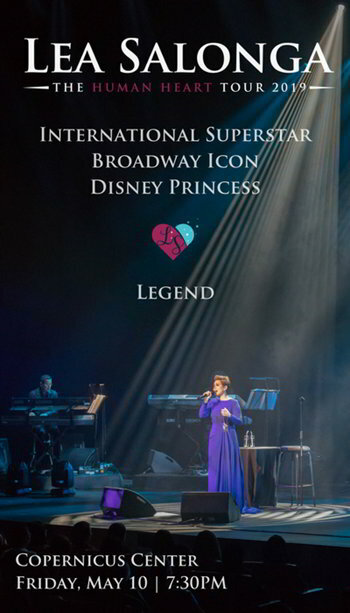 Don’t miss this rare Chicago-area appearance by international superstar and Broadway legend Lea Salonga in her The Human Heart 2019 North American tour. Known across the world for her powerful voice and perfect pitch, Lea is a singer and actress best known for her portrayal of Kim in Miss Saigon winning her the Tony, Drama Desk, Outer Critics Circle and Theatre World Awards. Lea starred as Eponine in Les Misérables on Broadway and returned to the beloved show as Fantine in the 2006 revival in addition to starring in the 10th and 25th Anniversary Concerts filmed and recorded for PBS. Lea’s other Broadway appearances include Flower Drum Song, Allegiance and, most recently, in the acclaimed Broadway revival of Once on This Island. Lea can be seen as a judge on The Voice in the Philippines and has appeared on the small screen in Crazy Ex Girlfriend, ER, and Hey, Mr. Producer. As a concert artist Lea has toured all over the world, performing sold out shows in some of the world’s most iconic venues including the Sydney Opera House, Disney Concert Hall, Singapore’s Esplanade, Hong Kong Cultural Center, Carnegie Hall, and London’s O2 Arena. In 2014, Lea performed with Il Divo for the group’s worldwide A Musical Affair tour and, in in 2017, she broke the record for most consecutive performances at New York’s famed Feinstein’s/54 Below with her show Blurred Lines. Lea has performed for six Philippine presidents, three American Presidents, and Her Majesty Queen Elizabeth II. Her solo recordings include Blurred Lines, The Journey So Far, and inspired.